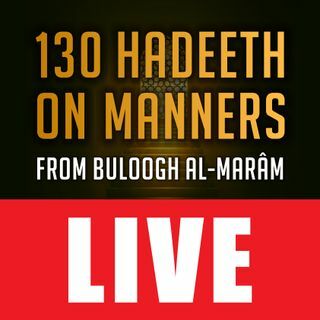 Moosaa Richardson continues his reading of Shaykh Saalih al-Fowzaan's explanation of the chapters on manners from Buloogh al-Maraam. This class covers the third hadeeth about righteousness, piety, and the consultation of the heart. These lessons are a study of the great book, Buloogh al-Maraam, by al-Haafith Ibn Hajar (may Allaah have Mercy on him). The explanation of Shaykh Saalih al-Fowzaan (may Allaah preserve him), Et-haaf al-Keraam, is read word-for-word, in Arabic, and translated ... See More into clear English. This fourth lesson was recorded at al-Masjid al-Awwal in Pittsburgh, Pennsylvania (USA) on 1440.01.27.